Our shuttle from San Jose will pick you up at your hotel or San Jose Intl. Airport *(See important notes) and drop you off at your hotel in Manzanillo. This trip usually takes about 4 hours depending on traffic conditions and drop off location. 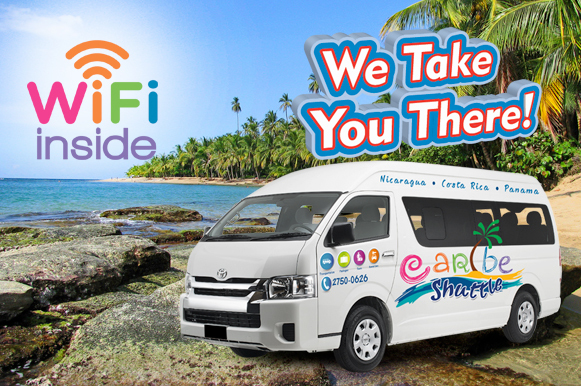 We also run direct hotel to hotel shuttle transport daily to a range of destinations across Costa Rica at affordable prices. Our shuttle vans are the latest model and are all air-conditioned. Our drivers are friendly and professional. Book your tickets now! Pick-up time is an estimate and may vary by 15 minutes either direction. Clients should be waiting at the assigned pick up point 15 minutes before the assigned pick-up time. The shuttle will wait for clients a maximum of 5 minutes. If after that waiting period the client is not on board, the shuttle will leave without the client and the client will NOT receive a refund. You are allowed 1 large bag or backpack and 1 carry on size (computer bag) per person. There is a $10 fee for each extra piece of luggage, odd or over size/weight luggage, surfboard bag.